In the past few years, we have covered a bunch of interesting telepresence robots here. 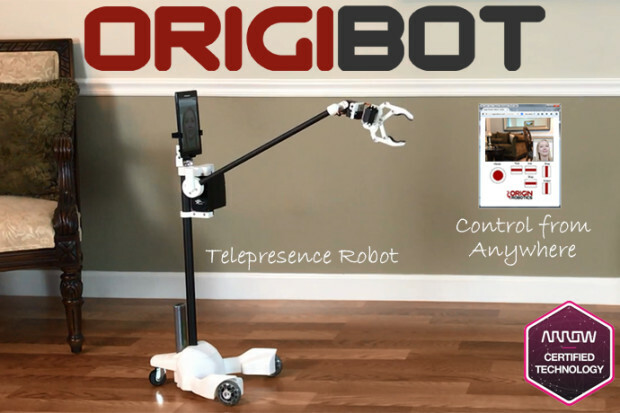 The ORIGIBOT2 is a fully hackable model with an arm and gripper, so you can use it to grab a bottle, get your remote, or open doors. The ORIGIBOT2 has a carbon fiber frame, better motors and stronger servos. It can be controlled from any device that has an internet connection, including smartphones. The robot has 7 degrees of freedom. It comes with an Arduino controller and Android tablet. You get 2-way audio & video in addition to full control of the robot. Expected to ship in March. You can find out more here. OVPiPod: Controlling a PhantomX Hexapod with an iPad?